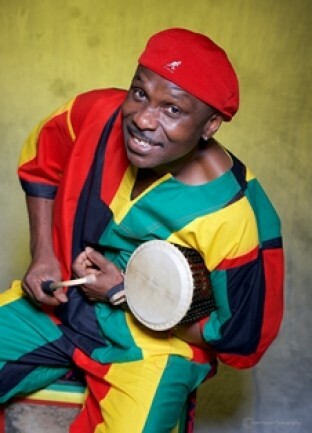 Chata Addy, “The Music Man”, was born and raised outside of Accra, Ghana; on the Atlantic coast of West Africa. This is where his special gift of music, through the robust influence, family tradition, and rich background in both traditional and contemporary music, was nurtured. Over the years, Chata has performed and recorded with the likes of his uncle, Obo Addy, King Sunny Ade, and many others. Settled down in Portland, Oregon, for the past 40 years, Chata Addy shares his love and knowledge of music with youth and adult audiences by way of performing with his bands, teaching traditional drumming, dance and music workshops around Oregon/Washington. Being a professional drummer, dancer, choreographer, songwriter, and teacher of the arts and culture from the West African traditions, you can find Chata Addy working as part of the Young Audiences of Oregon, working with a variety of community based youth organizations, and providing artistic programming for schools throughout the NW region. If it’s not obvious yet, music has always been a special part of Chata Addy’s life, thus earning him the name of “The Music Man”!